More than five million council house tenants in Britain will be given the right to buy their home under new government proposals. The Housing Bill published today will give tenants who have lived in their home for up to three years a 33% discount on the market value of their home, increasing in stages up to 50% for a tenancy of 20 years. The government believes the bill will transform the social structure of Britain for good. Michael Heseltine, secretary of state for the environment, said: "This bill lays the foundations for one of the most important social revolutions of this century." But Shelter, the organisation for homeless people, has said the move will increase the number of homeless people and decrease the number of homes available to accommodate them. Labour are vehemently opposed to the proposals believing the impact on the nation's pocket will be huge. Roy Hattersley, shadow environment spokesperson said: "We shall fight it very hard in the House of Commons and in the country." As a further incentive to prospective buyers the government will also offer tenants a 100% mortgage from the local authority. Those who cannot afford to buy their home immediately will be able to pay a �100 deposit and postpone the sale for two years at which time they will be able to purchase their home at today's prices. If local authorities do not comply with the new legislation the secretary of state will have the power to directly intervene in the sale. Critics have accused the government of being too generous to council house tenants but the prime minister, Margaret Thatcher and her government are sure the new policy will pave the way for a property-owning democracy and a more socially responsible population. Labour believe the cost to the public purse will be at least �5,000 per sale but the Conservatives maintain that central and local government will save millions through the reduction of subsidy to council house tenants. 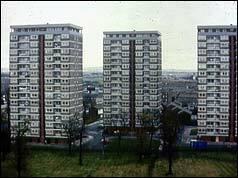 The Housing Act came into force on 3 October 1980. Many council tenants exercised their right-to-buy. By November 1982 the government said more than 400,000 people had bought their council homes. The right-to-buy scheme was subsequently extended to tenants in leasehold properties. The policy proved extremely popular and was seen as a major vote winner for Mrs Thatcher in 1979 and again in 1983. In 1985 Labour dropped its official opposition to the scheme. By 2003 it was estimated some 1.5 million council homes had been sold. However, the scheme contributed to a reduction in the number of available council homes and there is now a shortage of social housing across the UK. In areas of the UK the scheme has been abused and strict regulations have been introduced to prevent tenants reselling their property too quickly. In November 2005 the Scottish Executive suspended council house sales for a period of five years due to a shortage of affordable housing.